Original gravity = 1.052; final gravity = 1.018; abv = 4.3%; estimated IBU = 50. Very persistent ivory head with a little bit of lacing on the glass; it starts quite high, and lowers a bit as I drink the beer, but never disappears. The beer itself is a rich gold with a slight haze. A strong but not overwhelming pine and grapefruit dominate. I don’t pick up much in the way of malt (except towards the end of the glass, when the beer is warmed up a notch). The malt is in the background on this one, but definitely there. It supports a prominent bitterness from the hops, which is quite pleasant at the forefront but fades perhaps a little more harshly on the finish than I care for. In other words, the bitterness sticks around. The body is just about perfect on this one; moderate, but not overly thin or overly chewy. 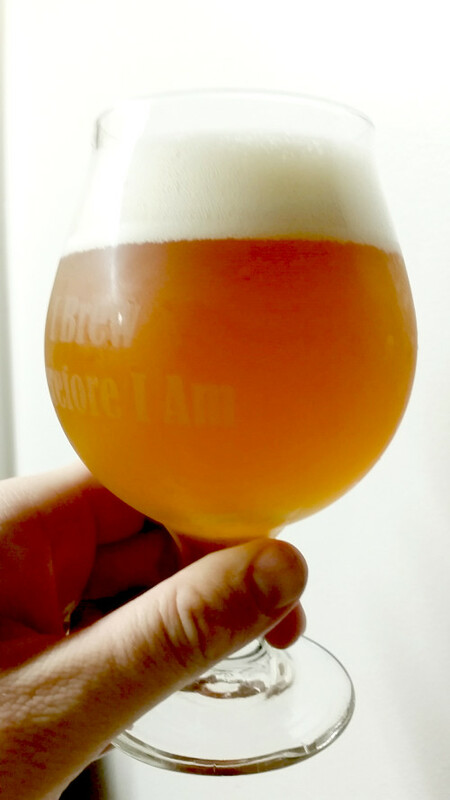 Carbonation is moderate and on-point for an IPA. Yes, with only slight modification. The appearance, aroma, and mouthfeel are exactly perfect for me, so I wouldn’t change the malt bill, mashing schedule, yeast, or dry-hopping. The only minor issue that I would care to fix would be to tone back the nature of the bitterness a bit; something a little more subtle might be nice. It’s not bad in this way (as discussed at my homebrew club when I brought it), just slightly outside my personal preference. So, I would probably change up the bittering hops for this recipe; dial them back just a touch, and aim for something with a smoother bittering profile (?Cascade). The beer is definitely a big step closer to my house session IPA recipe. Once I get the bittering hops figured out, I think the recipe is set! On Falconer’s Flight 7C’s: I quite like this hop blend. It basically says “West Coast IPA.” And despite the slight shortcomings for the bittering profile in this particular recipe, I think it would be fine for bittering in a bigger beer (i.e., a standard strength IPA). It’s just a _touch_ much for a session IPA. This entry was posted in session beer, session IPA, tastings and tagged Seven Seas Session IPA. Bookmark the permalink.